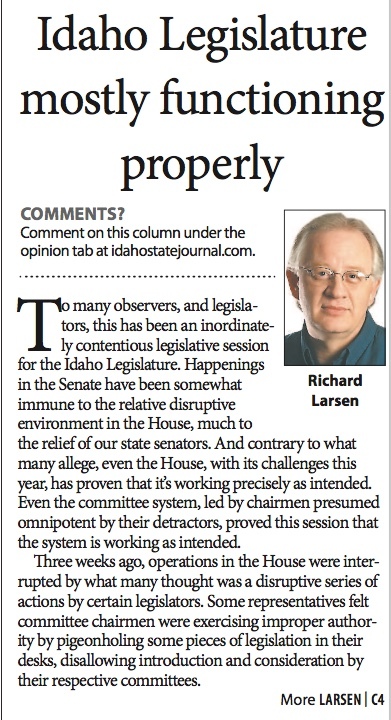 To many observers, and legislators, this has been an inordinately contentious legislative session for the Idaho Legislature. 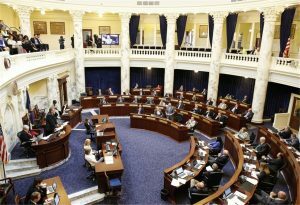 Happenings in the Senate have been somewhat immune to the relative disruptive environment in the House, much to the relief of our state senators. And contrary to what many allege, even the House, with its challenges this year, has proven that it’s working precisely as intended. Even the committee system, led by chairmen presumed omnipotent by their detractors, proved this session that the system is working as intended. Three weeks ago, operations in the House were interrupted by what many thought was a disruptive series of actions by certain legislators. Some Representatives felt committee chairmen were exercising improper authority by pigeonholing some pieces of legislation in their desks, disallowing introduction and consideration by their respective committees. This is the operational bible to the legislators, providing the doctrine and rules governing every aspect of legislative operations, and it rarely changes. 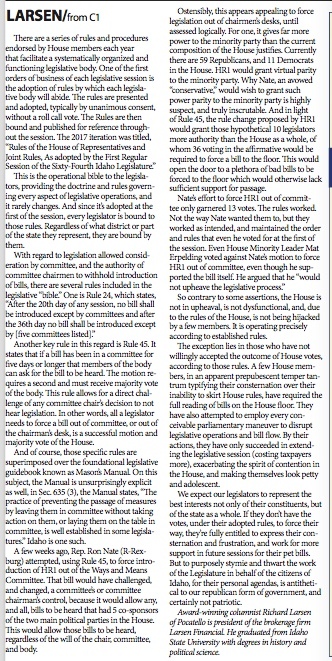 And since it’s adopted at the first of the session, every legislator is bound to those rules. Regardless of what district or part of the state they represent, they are bound by them. Another key rule in this regard is Rule 45. It states that if a bill has been in a committee for five days or longer that members of the body can ask for the bill to be heard. The motion requires a second and must receive majority vote of the body. This rule allows for a direct challenge of any committee chair’s decision to not hear legislation. In other words, all a legislator needs to force a bill out of committee, or out of the chairman’s desk, is a successful motion and majority vote of the House. And of course, those specific rules are superimposed over the foundational legislative guidebook known as Mason’s Manual. On this subject, the Manual is unsurprisingly explicit as well, in Sec. 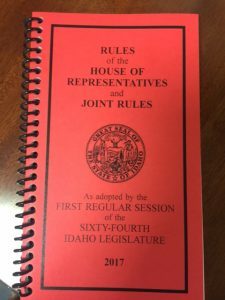 635 (3), the Manual states, “The practice of preventing the passage of measures by leaving them in committee without taking action on them, or laying them on the table in committee, is well established in some legislatures.” Idaho is one such. 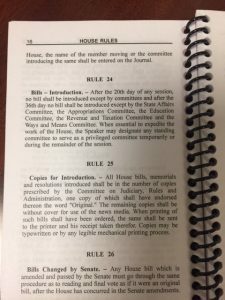 A few weeks ago, Rep. Ron Nate (R-Rexburg) attempted, using Rule 45, to force introduction of HR1 out of the Ways and Means Committee. That bill would have challenged, and changed, a committee’s or committee chairman’s control, because it would allow any, and all, bills to be heard that had 5 co-sponsors of the two main political parties in the House. This would allow those bills to be heard, regardless of the will of the chair, committee, and body. Ostensibly, this appears appealing to force legislation out of chairmen’s desks, until assessed logically. For one, it gives far more power to the minority party than the current composition of the House justifies. Currently there are 59 Republicans, and 11 Democrats in the House. HR1 would grant virtual parity to the minority party. Why Nate, an avowed “conservative,” would wish to grant such power parity to the minority party is highly suspect, and truly inscrutable. And in light of Rule 45, the rule change proposed by HR1 would grant those hypothetical 10 legislators more authority than the House as a whole, of whom 36 voting in the affirmative would be required to force a bill to the floor. This would open the door to a plethora of bad bills to be forced to the floor which would otherwise lack sufficient support for passage. So contrary to some assertions, the House is not in upheaval, is not dysfunctional, and, due to the rules of the House, is not being hijacked by a few members. It is operating precisely according to established rules. The exception lies in those who have not willingly accepted the outcome of House votes, according to those rules. A few House members, in an apparent prepubescent temper tantrum typifying their consternation over their inability to skirt House rules, have required the full reading of bills on the House floor. They have also attempted to employ every conceivable parliamentary maneuver to disrupt legislative operations and bill flow. By their actions, they have only succeeded in extending the legislative session (costing taxpayers more), exacerbating the spirit of contention in the House, and making themselves look petty and adolescent. 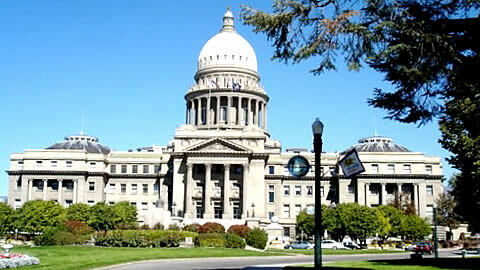 We expect our legislators to represent the best interests not only of their constituents, but of the state as a whole. If they don’t have the votes, under their adopted rules, to force their way, they’re fully entitled to express their consternation and frustration, and work for more support in future sessions for their pet bills. 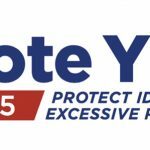 But to purposely stymy and thwart the work of the legislature in behalf of the citizens of Idaho, for their personal agendas, is antithetical to our republican form of government, and certainly not patriotic.